Humanoid robots placed in the position of consuming material goods to relieve human beings of the burden. In The Midas Plague, people were obligated to consume. By consuming more and more, you could graduate to higher levels of society, where you might actually have fewer things and more time to yourself. Or, you could get robots to do your consumption for you. There was the butler robot, hard at work, his copper face expressionless. Dressed in Morey's own sports knickers and golfing shoes, the robot solemnly hit a ball against the wall, picked it up and teed it, hit it again, over and again, with Morey's own clubs. Until the ball wore ragged and was replaced: and the shafts of the clubs leaned out of true; and the close-stitched seams of the clothing began to stretch and abrade. “My God!” said Morey hollowly. There were the maid-robots, exquisitely dressed in Cherry’s best, walking up and down in the delicate, slim shoes, sitting and rising and bending and turning. The cook-robots and the serving-robots were preparing dionysian meals. Morey had to sit down. One of the serving-robots politely scurried over with a chair, brought from upstairs for their new chores. Morey tasted the word between his lips. You never wasted things. You used them. If necessary, you drove yourself to the edge of breakdown to use them; you made every breath a burden and every hour a torment to use them, until through diligent consuming and/or occupational merit, you were promoted to the next higher class, and were allowed to consume less frantically. But you didn’t wantonly destroy or throw out. You consumed. Still, he reminded himself, the Board hadn’t found out. It might take some time before they did, for humans, after all, never entered robot quarters. There was no law against it, not even a sacrosanct custom. But there was no reason to. When breaks occurred, which was infrequently, maintenance robots or repair squads came in and put them back in order. Usually the humans involved didn’t even know it had happened, because the robots used their own TBR radio circuits and the process was next thing to automatic. From The Midas Plague, by Frederik Pohl. 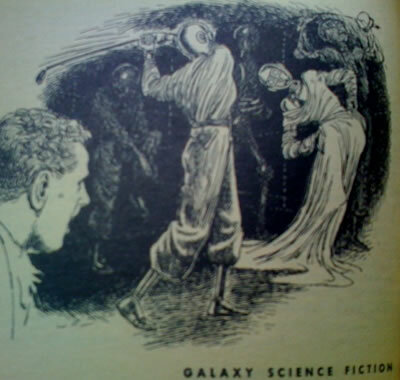 Here's an illustration taken from the original publication of the story in Galaxy.